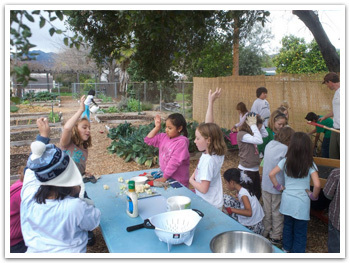 To give students a chance to get their hands dirty, we’ve also begun Garden Clubs at our elementary schools. Garden Club members volunteer time during recess to help weed, prune, and maintain our school gardens. Garden Club members earn a Food For Thought cap or apron if they visit 10 times before the winter break. At the end of the growing season, Garden Club members harvest the produce from dedicated garden boxes and sell it at their very own school farmers market, with proceeds going back into the Garden Club. 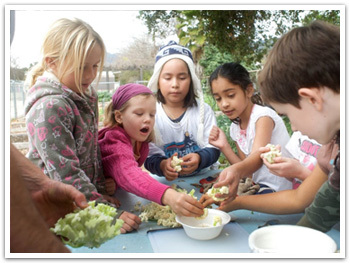 Food For Thought provides funding for Environmental Education Directors and Farm and Garden Education Assistants to oversee garden volunteers and the garden program in all five OUSD elementary schools. These knowledgeable folks work with teachers and students to keep our school gardens thriving and used for lessons in nutrition, history, geography, math, and science. As well as being a wondrous place to play, relax, taste and experience the joys of gardening. We also provide funding for garden tools, supplies and maintenance. We welcome volunteers to help us grow our garden program!